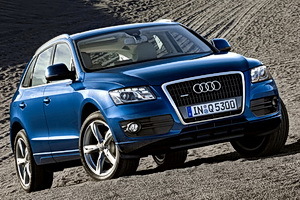 Audi on Dec. 28 released a press statement confirming that the Q5 Hybrid will begin production at the end of 2010. The vehicle will be the first hybrid car sold by the German automaker. The Q5 Hybrid may likely be based on the VW Touareg and Porsche Cayenne. The rumored powertrain is a 3.0 liter V6 with a 52-hp electric assist engine. A hybrid A4 model should follow soon after the Q5. Last year Audi canceled the Q5 Hybrid because the company was unhappy with the crash test results with nickel metal hydride batteries. This may have been an excuse to give Audi more time to develop their hybrid technology. There could be a chance that the Q5 could come equipped with lithium ion batteries which will improve fuel efficiency. Up until recently, Audi has relied on diesel technology to reduce emissions and improve efficiency, but to compete in the Luxury SUV’s market, Audi realized it would have to release a hybrid. Both BMW and Mercedes-Benz plan on releasing hybrid versions of their SUV’s. Audi plans on investing €7.9 billion over the next three years for its manufacturing plants in Germany and new models. An additional €5.9 billion will be spent on future product development. The company plans on expanding its model line from 34 to 42 models by 2015. New models like the A1, A7, A8 and R8 Spyder will be added to Audi’s lineup in 2010. In the future we could expect models like the Q5 to go completely electric. Audi showed off the an electric powered concept of the R8, named the e-tron, at the 2009 Los Angeles Auto show. The German automaker claimed that the concept produced an astronomical 3,319 lb-ft of torque. The e-tron really produces 501.5 lb-ft, which is still a very impressive number. Audi engineers claimed the 3,319 lb-ft number was based off how the car felt when the electric motors moved the car. Compare this to the speculated 221.24 lb-ft electric engine that will assist the Q5 Hybrid’s gasoline engine. If the e-tron hits the market in 2012, there may be future electric cars offered by Audi. The question remains if battery technology will make these electric cars feasible. Expect to see the Q5 Hybrid at the 2010 Los Angeles Auto Show. If you are talking about the first generation Prius, then the battery pack is about 125lbs and it weighs 2765lbs. A current gen Prius does have a ~99 lbs battery pack like you say, but does weigh over 3000lbs. I remain unimpressed with the Prius when cars in the 80′s got over 50 highway mpg. I will admit though those old cars you will die in, they are so unsafe compared to a modern car. Actually, hybrid vehicles also excel at highway speeds, due to the smaller gas engine required. My Prius performs as rated for efficiency, once you account for winter conditions, extra passengers and other factors. This is no different from gas-powered cars which also perform less than their rating under normal use. The Prius, currently the most efficient car in North America, uses 99 pounds of batteries compared to a total weight of 2,700 pounds, a little bit of extra weight to be sure, but hardly “an overweight package burdened with heavy batteries”. Hybrid cars really benefit people who drive short distances and for getting around town. But most of America is spread out and many spend a lot of time on the highways traveling faster than 40 mph — situations where hybrids do not excel. Why is Audi weakening under public pressure to produce a hybrid? Looking at the early specs, the Q5 hybrid is a joke. Audi should stick with its core competency and continue producing more cars with their TDI engines. Meanwhile, I’ll keep supporting and promoting clean diesel as much as possible since it is much cheaper than building a hybrid car and driving dynamics aren’t lost in an overweight package burdened with heavy batteries. Making the Q5 into a Hybrid is one huge mistake and I am suprised that Audi hasn’t learned a lesson from what Hybrid owners finally come to realize………hybrid technology to increase mileage is a sham! Ask any current hybrid owner of any hybrid car and they will all tell you they are not getting near the mileage they were told. The reason for the poor mileage performance is that once you start using a hybrid on the expressways and freeways you loose all the benefits of a hybrid. Audi needs to smarten up and do what they do in Europe deliver this car in the states as a diesel! I decided not to buy a Q5 because it is not availabel in the states as a diesel.